John Siracusa has an awesome take on video game remakes (in light of the recent Wind Waker HD announcement by Nintendo) over at Hypercritical, but I wanted to share my own thoughts on the matter. 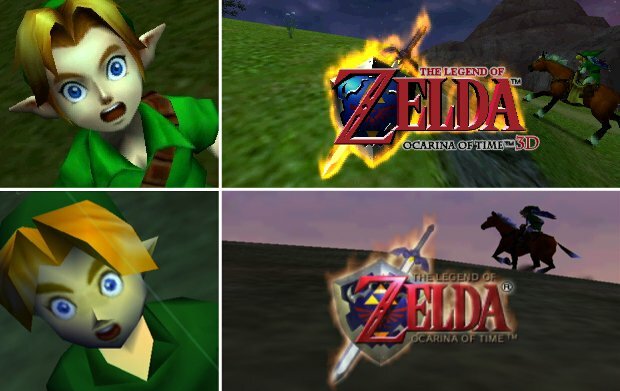 There have been a number of remakes and re-releases with graphical updates recently, the above image coming from the Ocarina of Time remake for the 3DS. I’m not afraid of these remakes and I don’t wish that they would go away for a number of reasons. I really like these games and would love to have them available on my new system. Wind Waker has been on my play-again list for a while and now I don’t have to try to find a Gamecube to play it again, I’ll just quietly wait for the Wii U version to be released. I can be patient. It gives developers a playground to try out new techniques and technologies. As was stated in the Nintendo Direct, Wind Waker HD was born out of trying out different art styles from the different Zelda games on the Wii U hardware. Making a fleshed-out game is only going to give them an opportunity to fine-tune some of their development software and graphics engines so that future games will be even better. The teams are generally smaller for these sorts of things so it might give the company an opportunity to let junior developers spread their wings a little to gain some valuable experience. I would imagine that remakes are a great way for something like that to happen. I just want to play these games again! Alright, the last one is purely my own want. However, I understand the flip side of this as well. These games weren’t originally developed on this system so the control schemes are generally not as smooth (unless a lot of work is done … think Twilight Princess-level work to add motion controls). It also does take talent and time away from new games. But it is known that just adding people to a project isn’t going to make it happen faster. Just “staffing up” can slow down a project sometimes as people need to get up to speed, might call into question decisions that have already been made, and also usually mean more managerial oversight as well. Those are not good things. If a company is committed to putting out high-quality remakes (as I expect Wind Waker HD will be … even though I’m guessing it will be Wind Waker U), then I’m not going to fear them.